Attendees at the Pointwise User Group Meeting 2016 held in Fort Worth, Texas on 21-22 September were the first people to get hands-on training with the recently released Pointwise V18 and its unstructured quad-dominant surface and hexahedra-dominant volume meshing. They were also able to see a diverse set of user presentations on topics ranging from aerodynamics of aircraft, rockets, and Australian V8 Supercars to the use of meshes for building construction and art sculptures and designing surfboards. In conjunction with the user group meeting, the Meshy Award 2016 for most outstanding mesh generated with Pointwise was presented to Dr. Bruce Hilbert and Melody Rees from Branch Technology, Inc. of Chattanooga, Tennessee. They use Pointwise meshes as part of the design process for their unique Cellular Fabrication™ 3-D printing technique for freeform building construction. Branch has used their technology to produce architectural elements, furniture, and exhibition structures. The winning 3-D structured grid was used as the basis for freeform printing the Casa d’Espania pavilion displayed at Cheekwood Botanical Gardens in Nashville as part of their International Playhouses competition. Unlike most uses of computational meshes, where the mesh is a hidden step in the process that is typically not displayed as part of the final results, Branch Technology is physically constructing 3-D meshes so the mesh is prominently displayed in the final product. 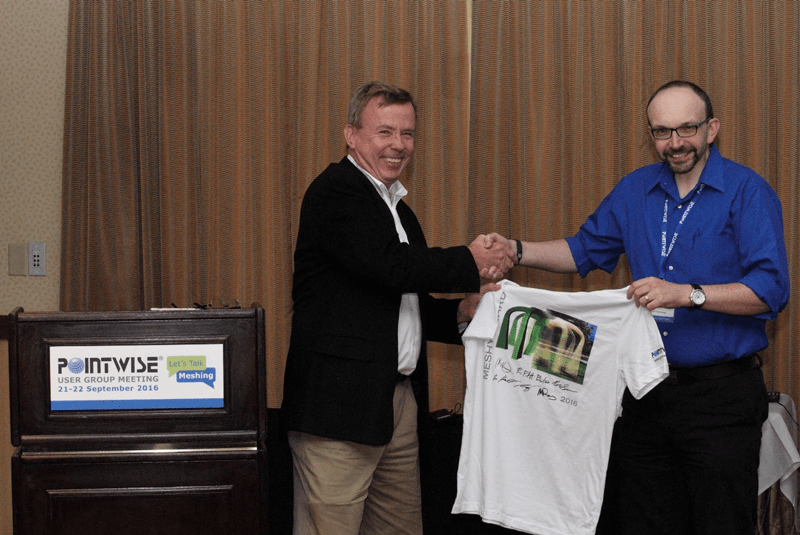 Figure 1: Pointwise’s Dr. John Steinbrenner presented the Meshy Award 2016 to Dr. Bruce Hilbert from Branch Technology, Inc. 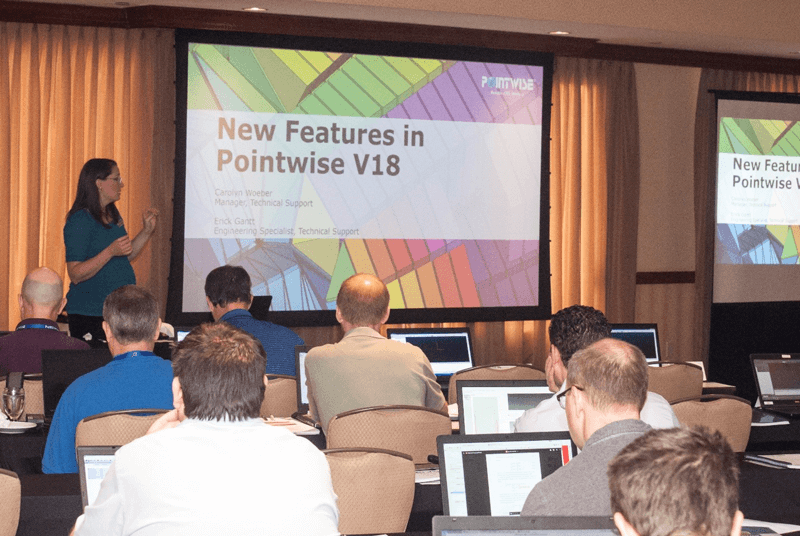 The first day of the meeting consisted of training seminars, which as mentioned previously included the first hands-on training with Pointwise V18. This is the first version of Pointwise to include the ability to make unstructured quad-dominant surface meshes. T-Rex (anisotropic tetrahedral extrusion) extrusions off these surfaces produce layers of unstructured hexahedra (off the quadrilaterals) and prisms (off the triangles) resulting in a hex-dominant boundary layer mesh. The reduced cell count and higher mesh quality compared to fully tetrahedral and hybrid prism-tetrahedral meshes results in fewer CFD (computational fluid dynamics) solver iterations required to get a more accurate solution. As a further improvement, Pointwise now handles blocks with diverse cell types so a single block can include tetrahedra, prisms, pyramids and hexahedra so T-Rex grids can be manipulated and examined for cell quality before exporting to a CFD solver. Figure 2: Carolyn Woeber, Pointwise manager of technical support, led the Pointwise new feature training. An additional major new capability attendees were introduced to was grid volume refinement via Sources and Shapes. Sources are regions within a volume where varying cell sizes can be specified. Shapes are quick ways to generate basic 3-D geometric entities, which are useful for defining Source regions, using a top-down approach. Sources are different from Pointwise’s existing baffle capability in that they can pass through the boundary of a block and through each other, giving more flexibility in setting cell sizes, and there is no requirement to place volume grid points on their boundaries, making them less restrictive than baffles. Sources are useful for defining off-body flow features, especially in cases where multiple features are present and where they may intersect or overlap. For example, separate, overlapping sources can be used for refining a wake and a shock wave when they intersect. The training day wrapped with a short course on Advanced Geometry Cleanup. This course covered how to handle common geometry issues such as gaps and overlaps, missing surfaces, and extraneous geometry present in a CAD model. After the meeting, this material was used as the basis for a webcast, Mastering Geometry Cleanup Tasks in Pointwise, that you can watch online. Day one of the meeting ended with a welcome reception that gave time for attendees to mingle with Pointwise folks and our exhibiting partners: ENGYS, Intelligent Light, Metacomp Technologies, Optimal Solutions and Tecplot. The second day of the meeting was a full day of technical presentations by Pointwise staff and users. John Chawner, president of Pointwise, started off the day with an overview of the current status of Pointwise. He also provided some perspectives on where the CAE industry in general and the CFD segment in particular seem to be heading and how Pointwise fits into that. 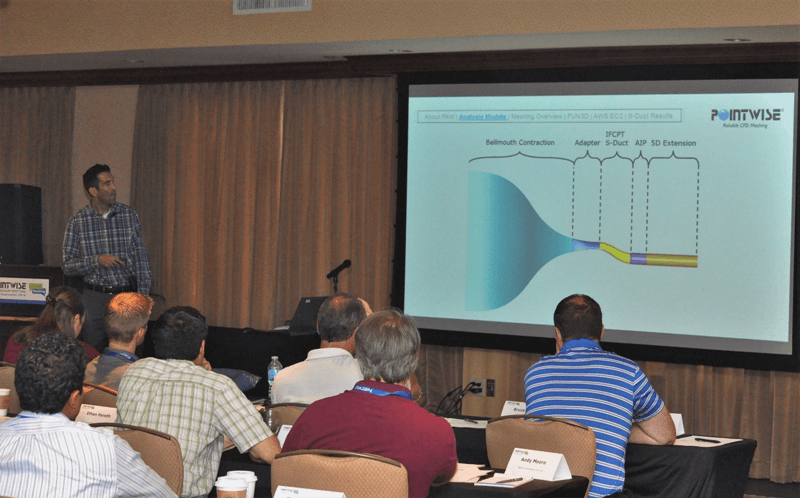 Figure 3: John Chawner briefed attendees on the latest work at Pointwise, Inc.
Meshing Overview & S-Duct Results Using FUN3D from the 3rd Propulsion Aerodynamics Workshop, Zach Davis, Pointwise, Inc. Figure 4: Zach Davis, senior engineer at Pointwise, presented details of meshes he made for the AIAA Propulsion Aerodynamics Workshop. Design Optimization of Big Wave Surfboards Using Pointwise and CRUNCH CFD, Jeremy Shipman, Combustion Research and Flow Technology, Inc. Innovative Freeform Extrusion Utilizing Grids Created with Pointwise, Dr. C. Bruce Hilbert, Branch Technology, Inc. 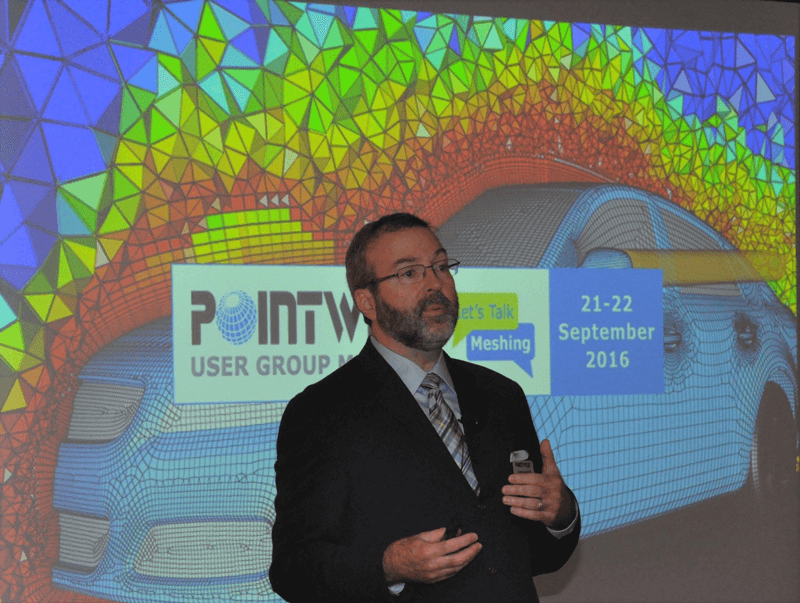 The Pointwise User Group Meeting 2016 was a great success and attendees universally commented they learned a lot from the training seminars, presentations, and networking sessions. If you are interested in attending a future Pointwise user group meeting or participating in one of our other interactive online or in-person events, please keep an eye on our Let’s Talk Meshing home page at www.pointwise.com/solutions for future event listings or subscribe to our mailing list using the form on this page.